You may notice after your child turns one that your house might as well be a jungle gym. Your toddler is scaling the couch and the coffee table, summiting the stairs, and, to your dismay, attempting to vault out of the crib. 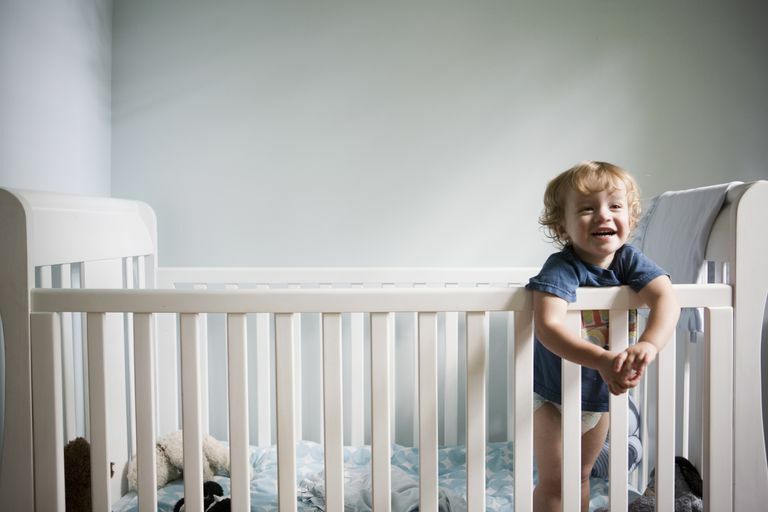 Realizing that your young child is able to climb out of the crib is scary for parents, and it's not uncommon to immediately think your toddler’s newfound jailbreak skills means it’s time to transition to a big kid bed. But not so fast. According to Lori Strong, certified sleep consultant and owner of Strong Little Sleepers in Austin, Texas, climbing out of the crib does not always mean you have to make the switch to a toddler bed immediately. Don’t overreact in front of your toddler when he climbs (or attempts to climb) out of the crib. Getting a big reaction from mom or dad, even if it’s a negative one, will often lead to your little one performing his new trick again. Set boundaries and expectations. If you catch your toddler in the act of trying to climb out of the crib, a firm “no” can often keep stop her in her tracks. Remove items from the crib that can give toddlers a boost. Stuffed animals, books, toys, blankets, and pillows can all be used as a step for toddlers who are trying to escape their cribs. Use a sleep sack. Putting a sleep sack on your toddler backward (so they can’t unzip it) can keep your toddler from putting his leg over the crib. So when is it the right time to make the switch? Every child is different, but according to Strong, it’s best to wait until your toddler is at least 2 to transition to a big kid bed, but the closer your child is to 3, the better. Three-year-olds are better able to handle the freedom that comes with a big kid bed — their developmental milestones include the ability understand consequences and cause and effect, they can problem solve, and they are beginning to have concepts of time, which will help tremendously if your child is an early riser. But ultimately, there’s no set age when you have to move your toddler from a crib to a big kid bed. As long as your child is comfortable and happy, don’t surprise them with a bed one day out of the blue. The switch to a toddler bed should be handled as a transition, not an overnight change.